I’ve been afraid to write this post. I’ve toyed with the idea for a couple of years now. And, honestly, I chickened out. A couple of years ago, in the comments after one of my posts (I can’t even remember what the post was about), we had some pretty spirited discussion about whether writing was a calling. I had some thoughts about it that I kind of wanted to share. But there were strong feelings on both sides, and I decided the topic was apparently a bit controversial. I also figured I didn’t know enough to fill a future blog post. So I avoided the topic. And then every few months as I would look at blog ideas, I would think about it again, feeling like maybe it was time to talk about it. But no, I would choose something more fun or more educational to write about (bwok bwok). But then when we looked at re-launching the blog this month, God waved that topic in front of me one more time. I decided that discussing the idea of vocation would be a perfect post for the new year. Several years ago, my husband preached a sermon about God calling us each to a vocation. He wanted to make the point that it’s not only clergy who are called. Every person is called to something. That’s when I really started thinking that maybe my writing was a vocation. You see, up until that point, writing for publication had been a dream. This crazy, nebulous, looong-term goal (often thwarted!). It had been something I enjoyed, so it felt like a reward. It had been something I thought would be the perfect job to have while staying home with my children that would add some financial support to my family. But a vocation? No. Once I made my first sale and had been at the job of writing for a while, I found that I wanted to write because I loved it, because I loved the community I had become a part of (y’all included! ), and because I had started getting wonderful emails and letters from readers who had been touched by the stories. I was blown away. I had no idea my words could do that. It started to sink in that maybe my writing could be a ministry. And if so, could that possibly mean God had called me to writing? I questioned this because during college, while on a retreat and praying for direction in my life (and deciding between two possible career paths), I had felt God’s leading to pursue a career in microbiology. Out in a grassy field by myself, praying more earnestly than I had ever prayed, I felt this clear thought/voice in my head telling me to do whichever I would enjoy. Do what I enjoy? That felt rather anticlimactic. Honestly, I had expected the heavens to open and have God tell me if I went into physical therapy I would heal people and change lives. But what I wanted to do?? Well, I was fascinated by all things microscopic. I had loved bacteria and identifying them ever since a unit I’d had in high school Advanced Biology class. I LOVED microbiology and loved being behind a microscope—but had feared that I needed to be working directly with people to make a difference. But through further prayer, I felt God assuring me that I would work with people in the lab: my co-workers. And I would help sick people through identifying what organism was making them sick, even if they never knew who was behind that microscope. 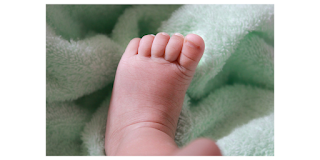 So I made my choice—the one I had wanted to make all along, and had a wonderful career until I had my first child…and felt called to be a stay-at-home mom. That calling was much clearer. I never doubted. Plus, my husband felt that calling for our family as well. So down the road, when I began pursuing publication, I still had small children at home. I was still involved in following the call to be a stay-at-home mom. Had God called me to writing, too? Or was I just enjoying something fun that was adding income to the family while being a homemaker? At first when I heard this, I thought of MY voice—as in using my voice. Sharing my faith through my voice—my writing. 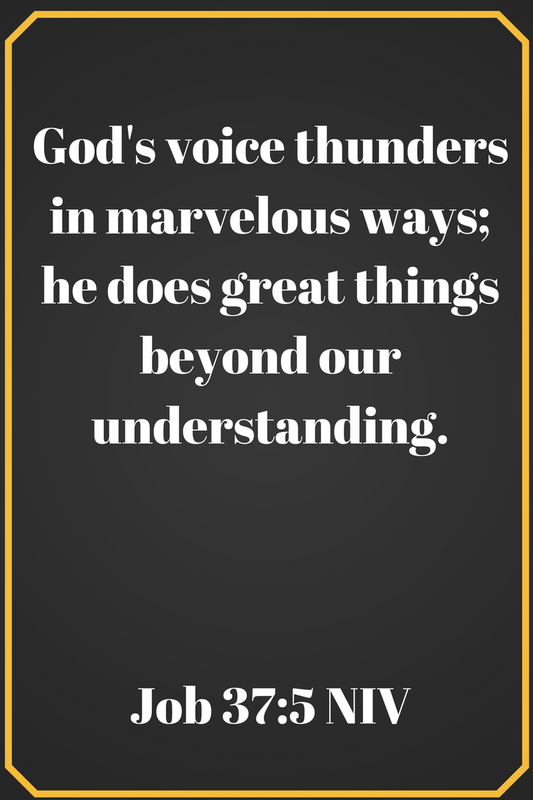 And I was thinking of writing a blog post about how God allows me to use my voice. But that’s not what my husband was talking about. He was talking about responding to God’s voice. All those words are connected. Vocation, voice, to call. Like I said, God calls each and every one of us to a vocation. Our vocation (what we do with our lives) is our response to God’s voice calling us. I have to tell you, that sort of blew my mind. You mean God has called me to this cool career? It’s not only a dream/joy/paying job? My love of writing is actually a calling? I think I was afraid to admit that maybe God had called me to write. If I admitted that, then I would have to go all in. Might He hold me accountable? What if I failed? What if my writing wasn’t good enough? What if my writing was okay, but I didn’t have my own theology figured out enough to write a legit message into my stories? What if I put a message in my story and I got it WRONG? So many beautiful letters from generous people who’ve taken the time to write to me and lead me to realize that, yes, God was using my writing to touch lives. For me, yes, it is a job. I do want to make money from it. And yes, I do enjoy doing it. I get unfathomable joy from creating something from ideas in my head that fly out of my fingers onto the keyboard. But it’s also a ministry. Whether you like the term “calling” or not, writing is my way to follow God’s voice. I realized it didn’t matter anymore what crazy fears were knocking around in my head. I knew: God had called me to write. And it taught me that God can use me in different ways. And maybe He never has just one specific way. Maybe God wants us to do what makes us happy while showing His love to others in whatever way we can. What about you? 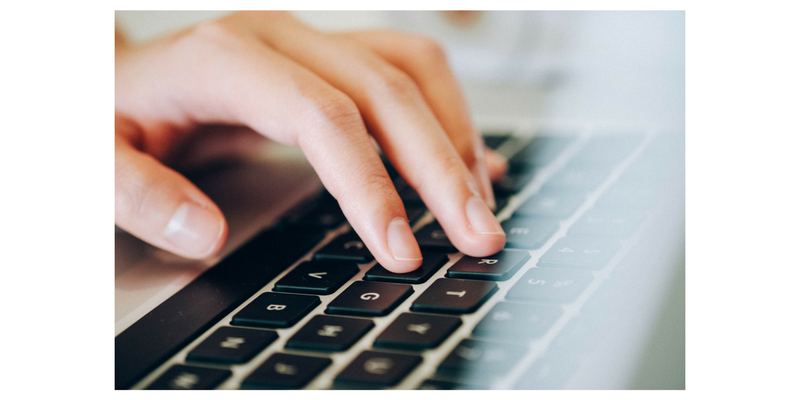 Do you think God is calling you to write (or teach, or crunch numbers, or wait tables, or change diapers, or support your family in any way you can at the moment)? 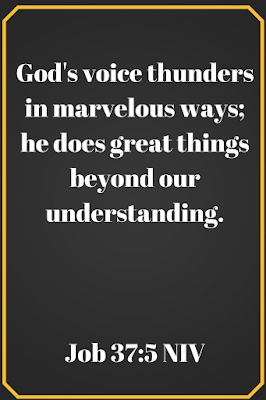 Do you hear God’s voice? Or, like I was, are you afraid to acknowledge God’s voice? I’ve had a favorite quote for many years. I want to share it with you. It’s funny how long I loved this quote before I really thought about how it could touch my own life. Maybe it can help you find your vocation, too. Think on that for a while, and let’s chat (she says, with her knees knocking)! :) Today I'd like to offer to one commenter a critique of the first five pages of a manuscript—those very important pages that hook the reader! Be sure to let me know in the comments if you’d like to be entered. I know that I've said this at least a thousand times here, but I think it's worth repeating. I see writers as having this wonderful opportunity to reach out to us readers through the written word. And I believe it can be a calling from God on your life. A mission field if you will, a ministry, a vocation as you said here Missy. If you feel the tug on your heart to write, then do it! He'll give you the words and maybe what you have to say in a book will touch someones life right where they are! The examples of the readers email to you are perfect. Someone could be going through something and need to hear from God & He could use your book to help them hear His voice. You can impact an entire world through just one book (or city, or town, or whatever). I think each of us has a duty to find out just what God has for us to do. And if we don't know, keep seeking! Keep doing what feels right in your heart. Sometimes we miss it and that's okay, but get back on track and trust the Lord to guide you. Trixi, thanks for your words of wisdom. I love this quote: "You never know what your readers will hear God speak to them, it could be life changing." That's so true! And it could be something totally different from what I had in mind while writing. We see this with my husband's messages as well. People will tell him things they took away from the sermon, and they can be things he never thought of while preparing. Missy, I think God calls us to do different things at different times in our lives. I'm preparing to enter a new phase of my life and I see writing playing a much bigger role. Is it a calling? I honestly don't know. I do know God has given me the desire to write and I want my writing to be pleasing to Him. I would love to be entered for the critique. Terri, I pray the new phase allows you more time to write! You'll have to know how it's going. "Your love has given me great joy and encouragement, because you, brother, have refreshed the hearts of the Lord’s people." If you write with love and you love to write then writing is an avocation which brings joy and encouragement and renews the spirit of the faithful. That's what you do in your books and why reading them always leaves me feeling refreshed. That's so nice of you to say that, Vince. Thank you! And what a wonderful verse of Scripture! Thanks for sharing. Missy, God is using your writing to touch lives! Thank you for the post! Because that's what I'm supposed to do. I know it... and years ago it was you who said "Well, Ruthy, that's your calling." And I realized it was. Not a mission... but a calling. And that's a big difference because a mission can be Ruthy-inspired. A calling is God-led. Thank you, Missy. Thank you. Ruthy, empowering women is a wonderful thing. I'm so glad you stuck with that calling through all your other day jobs, working to support your family and preparing for the day when you could have your time to write. I think that's a route a lot of us have to take because in the early stages the career can cost money before making any. I'm glad you're able to fully realize your calling now! Awesome post Missy. Simply put...awesome. Thank you. You are correct when you said, Yes, the pastor’s wife really does listen and learn!). I too am a pastor's wife and I take notes on his sermons every week. Last week I received my word for this year from his sermon. In fact the word felt like it hit me write in the chest as he spoke it. That word is ENGAGE and I plan to do just that in many areas of my life this year. I'm glad to hear you take notes as well! I don't write anything down. But I do listen and jot notes later if it's something I want to remember. In fact, I've even toyed with the idea of using thoughts that I have during his sermons for my personal blog. Maybe someday! I'm glad you got your One Word! I'm still thinking and praying. Great post, Missy! He has designed each of us in His own unique way to impact our sphere of influence. May we ALL do what HE had called us to do! Blessings! I loved your post...and yes, I believe writing is one of my callings. I also think every job in my life has been a necessary step (even the ones I dreaded like being a maid) that taught me about people, myself, and resilience that I could use for my call to teach. I am now blissfully happy as a teacher (in my 19th year of teaching! eeek!) what I call my day calling and writing, my other calling that is fulfilled whenever I can squeeze in time...whether day or night. I'm not published yet...(so I would love to be thrown in the critique drawing). Jeanine, that's wonderful about your call to teach! Your students are blessed to have someone who loves what she's doing. I love your term "day calling." :) I think that's a common thing for writers. Thank you for this beautiful post, Missy. I know that writing is my calling. I'd never been where I am now, in such a short period of time, if it weren't. God has placed the right people on my path and presented opportunities I never knew existed. Thank you for your inspiring words. Now, off to my colonoscopy...yipe! Jill, if you're heading to the doctor now, then the worst (the prep) is already over! :) I hope the procedure goes well. Have I mentioned that I just smile every time I come to this page??? You said "Voice = voce" and doesn't "sotto voce" mean "speak softly"? I think God speaks softly to me about my writing, a whispered conversation perhaps, rather than a call. :) Sometimes I tell Him, "I wish you'd speak up now." I love this, Dana! Your comment made me think of something I read one time (can't remember where!) that we're often straining to hear God's voice in the midst of our business, but what we really need is a time of quiet to hear that still, small voice speaking to our hearts. 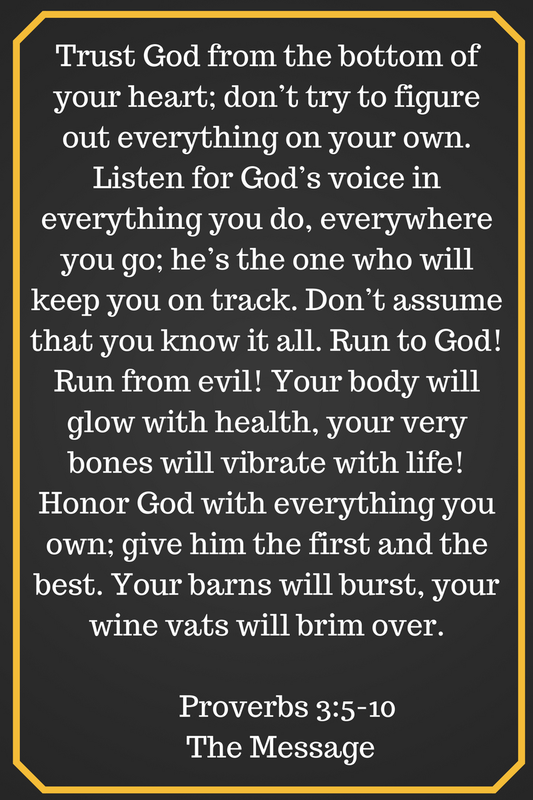 I think that's why I often charging ahead of His guidance...I don't slow down enough to listen! Thank you for sharing your heart and your journey. I feel like I know you a bit better and I loved your sweet spirit before. and God has spoken to me through them about all kinds of issues and circumstances. So I can say with some authority that writing is indeed ministry to any who are open to receive. Tracey, thank you for that. It’s nice to know that the things God teaches authors can help others. Many times my themes end up being what God is working on in me at the time. I'm so thankful God led me to start writing again when I was 32 and wishing that God would give me a purpose in life. As soon as I started writing again, I knew. This was God's intention, his purpose, his calling, his ministry for me. Writing has many functions in my life. Right now it supports me and my two daughters financially. It keeps me sane. It motivates me. And God uses it, which gives so much joy and meaning to my life. He uses it to encourage and uplift and strengthen other people's faith in him, and that means more to me than I can ever express. But if God ever has anything else for me, if he asks me to lay it down, I feel like I could do that. I don't ever want it to become an idol or to distract me from him. Way to go, Missy!!! You overcame your fear of this topic! ;-) God will bless you every time you step out for him. Hugs! Melanie, that’s such a good point about being able to lay it down. I hope I could do that if I felt that leading. Of course I could always write for fun even if I felt called to another career or felt called to retirement. Love this post, Missy. I'm still working on whether writing is my calling or not and exactly what that looks like. I don't feel a pull toward anything else, so at this point I assume this is what God wants from me. I'll just keep praying and seeking and putting words on paper. If it's what He wants, He'll let me know. And I'd love to be entered in the drawing. Thanks! Glynis, that sounds like a wonderful plan. I pray you feel a strong sense of direction. Gotta run to the dentist for an emergency appointment!! I think I broke a tooth. Will check back as soon as I can! Praying your visit will be quick, easy, and pain free! I'm so sorry about your tooth. I'm so sorry. I will be at the dentist this afternoon myself. Not exactly my choice for my birthday but it was the earliest they could get me in. Praying all goes well for you. Thanks everyone! The news isn’t good. Will require eventually having the tooth pulled and getting an implant. Who knew a bacon, egg and cheese biscuit could be dangerous?!! Wilani, hope your visit goes better. Happy birthday!! Thankfully he didn't pull the tooth but it took 5 shots to get the tooth numbed. He had to cut the crown off to get to the tooth to fix it, so will need to put a new crown on in a couple weeks. It has been a good day over all. I went out to lunch with one friend and then out to supper with another friend. Wilani, I'm glad you were able to get your tooth fixed and will be able to finish up soon. Missy, this is deep. I think that anyone who ministers God's word is called, whether teaching five-year-olds, speaking from a pulpit, or this. We had better be sure of it, because sometimes our call is the only thing that keeps us going. I never had a Damsascus moment, but then I've never had a Damascus moment about anything else. I just know God has given me a desire to touch people's lives through fiction, and the stamina to do whatever it takes. Or not do whatever I shouldn't be doing. It's not always easy. I think of missionaries who labor 10 or even 20 years before they get their first convert. My deepest desire is that He use my writing to touch someone. It's tricky for me because I also write nonfiction for a living. Some of the skills and the discipline are transferable, but it's still a different dynamic. Standing up and applauding you, Missy! As I deeply know, it takes courage to share your deepest indecisions with the world! You go, girlfriend!! Your books have touched so many readers, of which I'm one. No one else can fill the pages of a book the way you can - with your humor, insight and message - what a hole there'd be in life if Missy Tippens hadn't listened to that voca telling her to find her joy. It's spread to the rest of us. Keep writing - it's your vocation! Aww, Audra, you just made me teary. Thanks for your sweet words. Missy, awesome post! I'd love to be entered for a critique. When I started writing, it was something I did. I told my best friend if I never get published it will be okay. It's the time God and I talk. But the more I write, the more I want to share what God's saying. There's a message in the stories we write that God knows someone needs to hear. He knows when they will pick up your book and read it and need to hear that message. I hadn't thought of that! Yes to those contest judges getting to read all those words inspired by God! Missy, I firmly believe that writing Christian fiction is a calling. When I first started writing, it was for the secular market. I didn't even know Christian fiction existed. Soon after, I discovered ACFW and felt God nudging me to write for Him. Oh, I resisted. Like you, I wasn't sure I wanted to be held accountable. Finally, I relented, somewhat begrudgingly, telling God He'd have to help me. Of course, that's what He wanted all along and He politely informed that He'd already given me every word I'd ever written. I've never regretted that decision. Like the Bible says, every good and perfect gift is from above. My writing may not be perfect, but it was the perfect gift for me. Even in the most challenging of times, because that's when I have to rely on God most for the words He wants me to write. And those are always the best words of all. That’s such an interesting and inspiring thought. One I’ll be considering and praying about! Also, over the years I loved to read and create stories. I'd write stories for my little brother and then read them to Chris. He was sweet to listen. I've loved pharmacy, but I also dreamed of writing. One day I felt God telling me it was time to explore that calling. I heard that God puts certain longings in our hearts. If God gives us the longing to write for his glory, why shouldn't we try? I continue to write with the dream of publication. Missy, your stories always touch my heart. I'm glad you acted upon God's calling. Five page critique? Yes, please add my name to the pot. Jackie, I’m so glad you’re continuing to pursue that leading to write. It’s wonderful that it’s something we can pursue in the midst of other careers and callings. Thank you for sharing about your wonderful dad! That would make a great blog post. I have to agree with your husband, Missy. "Every person is called to something." I also think it isn't too hard to determine that calling...if God takes His rightful place in our lives. Many people think that if they enjoy something, it can't be what God is calling them to do. They think His calling has to be something hard. Dramatic. Painful. No. I believe that God calls each of us to point others to Him, and that's easy. We can do it as we sit at the dinner table with our family, or while we give the baby a bath. We can do it as we ring up groceries at Walmart or as we teach a class full of students. Pointing others to Christ is as natural as breathing for a Christian, and often we do it without words. For those of us who write, we are privileged to point our readers to God through our stories. The way that looks for each of us is as varied as our fingerprints. Thank you for this thoughtful and thought-provoking post! Yes, every person is called to something. But why not different things at different times in your life? Why not seasons of life? So the calling to microbiology (wow, I've never had that!) and then at a different season of life, the calling to write...why not??? Exactly! That's why they're called seasons! Jan, I had a partial post typed up while in the dentist's chair but then I got home and it's disappeared. I'll try to remember what I typed! I said I really wished I had your wisdom and advice years ago! It might have saved me some angst. :) I LOVE how you made it simple. We're to show the love of Christ in all we do. Mary, you're right. I don't know why we think that we get one calling for life and that's it. Talk about pressure! LOL, Missy! Years ago, I was struggling over this! Then I heard the first question in the Westminster Catechism: "What is the chief end of man?" The answer? "Man's chief end is to glorify God and enjoy Him forever." That simple statement clarified things for me immensely! Yes, Jan! My husband has oft quoted that as well. With each of the writing projects I have going, the Lord specifically laid it on my heart to write. It is true we need to be in tune with the Lord's calling and direction in our lives. I would love to be in the drawing for a critique. Wilani, that's wonderful that you've known each time you're supposed to be writing that story! That often makes the story easier to write. Missy, this is a great post. I haven't really thought about whether or not writing is a calling, although I have wanted to do it since I was a child. If it is a calling, then I feel like I am not doing a good job following it at times when I let too much else get in the way of doing it. Maybe I need to listen more closely to God. Please enter me in the drawing for the critique. Hope you get your tooth fixed quickly. Sandy, I've had times like those, too--sometimes caused by outside circumstance and responsibilities, other times self-imposed. Times where I felt like I was neglecting my call. Then when I get back to work, it's like coming home. I absolutely agree that everyone has a calling in their lives. I'm with you though, when I started writing I never dreamed it could be something I enjoyed doing and had answered a call. I mean, shouldn't all calls be living in the jungle bringing people to Christ? Would God actually allow me to enjoy the very gift he gave me? Too cool for words. No pun intended. Ha! Love your pun, Sharee! :) And yes, it's so very cool to enjoy what I'm doing! I've always believed GOD put the fire in my heart for what I'm supposed to do. I love writing - my own stories and book reviews. When I get a rejection I tell myself "it isn't my time" and try not to let the fear/doubts take over (sometimes they win). So I do believe writing is a calling and sometimes I think we (or me) gets in my own way of following through with this calling. Yes please on being entered for a critique. Marcie, it's so hard not to let the rejections get us down. More than once, I'm fallen to the floor distraught, crying. It's a terrible place to be. But each time God has helped me bounce back and given me the will to keep going. I'm glad you're able to do the same! Hi Missy - you know I love your books and am so glad God called you to this profession that touches so many others in such a wonderful way. I do feel God has called me to write, but sometimes I wonder if I've got it all wrong. I have a day job - a real job - that earns me a paycheck. I like my job and know it fulfills in ways writing doesn't, but at the same time I get very frustrated with having to get up and go to work every morning when what I really want to do is stay home and write. It's enough to make me wonder - should I give up writing and let my job be my focus? I can't imagine doing that. Should I give up my job and just write? The financial aspects of that option (I'm not published!) are quite frightening. So, I just keep plugging away, giving myself to both occupations and hoping someday I will find the balance that makes me truly happy. Thanks for sharing your story and your stories! Please enter me for the critique. Cindy R, thanks for bringing up that dilemma. I think a LOT of writers have it. The day job brings home needed income, but it keep them from the writing. I'm very grateful that I've had my husband supporting me through the early years when my business operated at a loss. His income paid for all the postage on contest entries and submissions (back in the day where you sent a manuscript in snail mail with a return envelope with postage on it!) and for conference fees. A couple of times I almost gave up writing because I felt like it was taking away from my family's resources. But then God would encourage me in some way, like positive feedback or a contest win. So I kept going, trying to have faith that I was following what I was supposed to do. I love this, Missy. Very thoughtful and wise. It's uplifting to think that God could want us to do what we love doing. I think we often believe God wants hard things from us. Heavy lifting. But why wouldn't he put a love for something in our hearts that is the right thing for us to do? Thank you a million times over, Missy! This post was just what I needed to read. I am still young, only 17, and I have struggled over callings and where I am supposed to be and how others will react to my decisions. But this post makes sense to me. It has helped me and raised me up. From one Christian writer to another, thank you!! I would also love to be entered for a critique! Kalan, I'm glad you found it helpful! You're young with lots of time to figure out where God is leading you. :) I hope you'll keep listening and praying and enjoy being a student. And that you'll keep learning. College can be a great time to figure out what direction God has in mind for you. You can take classes on many subjects--which helps you find the things you love. Hello Missy, I'm so glad you overcame your reluctance to take on this topic! I do believe God gives us the desires of our hearts because He lays those desires on our hearts to begin with, and He knows what work He has for us. I've dreamed of being a writer since I was a kid in school-like so many of us. The need to make a living put it on the back burner. And for years I didn't see how I could write Christian fiction but that all changed in late 2015, and then I found Seekerville and a whole new world opened up for me. And as I'm not published yet, yes please, could you put my name in the critique draw? have a blessed day! Laurie, I'm so glad you found us here at the blog! I hope you'll keep at the writing. I love to hear about people who have wanted to be a writer since they were kids. When I was a kid, all I wanted to do was read! LOL It never occurred to me to write. :) All I knew was that I loved the smell of books (we had a Bookmobile that come to our neighborhood! ), and the feel of a book in my hand. My original post never posted. Computers! Sigh. Kathy, I'm sorry your post disappeared! Probably Blogger's fault. I've got you entered. Hi Missy, love this post! So glad you are writing 'cause your books are always so inspiring! Awww, Missy. Thank you for bringing this topic to the table, and for sharing your humble and insightful perspective. It touched me. 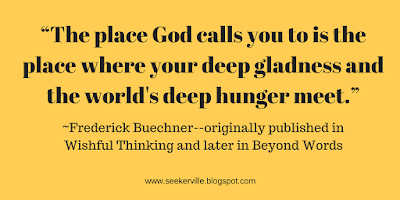 And that quote by Frederick Buechner is profound. I had never considered the similarities between vocation, voice, and calling before. I loved reading about that. I'm still mulling all your thoughts. I know God calls us to various things. He's hardwired into each of us a unique plan for our lives. I love when He reveals His callings for us, and that when we follow them, we can know great joy (and often hard work) in living them out. I'm still meditating on all you've shared. I'm soooo glad you published this post. Well done! Oh, Missy, what a WONDERFUL post, my friend -- I'm glad you decided to share it with us because it is SO dead-on!! You said: "I felt this clear thought/voice in my head telling me to do whichever I would enjoy. Do what I enjoy?" LOL ... 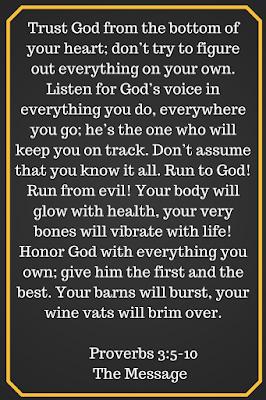 I grinned when I read this because instantly I thought of Eric Liddell from Chariots of Fire saying, "God made me fast. And when I run, I feel His pleasure." And I feel His pleasure when I write or even look into a dictionary or thesaurus!! And I especially feel His pleasure when like those amazing letters you received, someone tells me that the words I put together brought them closer to God. WOW. WOW. WOW!!!! When one finds the career that both God and you have chosen for yourself, pleasure abounds!! That's so true, Julie, about finding a career that both God and you choose. I'm smiling reading this from both of you. Missy, this is such a lovely, inspiring post. Thank you! The reader letters you shared touched me and I'm sure encourage you when doubts creep in. I believe God calls us to join Him in His work. To me His work involves sharing the Good News and loving our neighbor. Why would God plant talent and dreams in our heads and hearts unless He wants us to enjoy and be prepared to do the work. 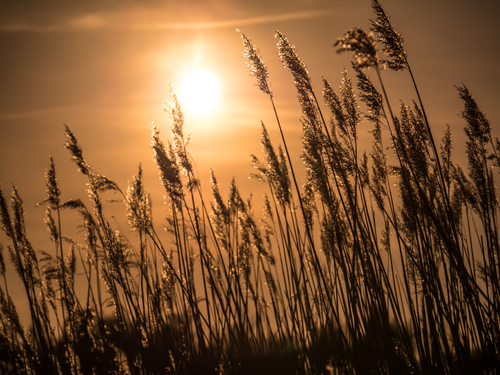 Whatever we do, if we look, we'll see opportunities to use our lives to honor God. Janet, I love that philosophy of joining God in His work. I loved that part of Henry Blackaby's study, Experiencing God. It's a great way to look at our Christian life! Missy, Blackaby's Experiencing God is a great study! What a thought-provoking post straight from you heart! I recognized myself in so many of your words. I was raised in a church where it felt like if you were truly serving God, it was a sacrifice. If it didn't cost you something, you weren't doing it right. The notion that God might call someone to do something they were 1) good at, and 2) gifted to do, and 3) enjoyed doing...that was a mind-blowing concept. So freeing to realize that God does call His people to do His will using the gifts He has given and the joy He provides. Erica, I don't really know where I got my ideas on having a calling. And I don't know why I was so resistant--except maybe for the fear of getting everything wrong. I do specifically remember having a moment when I took the Experiencing God class (Henry Blackaby) for the first time, and we talked about Moses and his rejection of the call, and him feeling unqualified. And I realized that I was doing the same thing. Missy, such a thought provoking post! AP Biology was my favorite class in high school...God’s creation so awesomely designed. So I felt my vocation was to be a nurse. Then the summer after my college freshman year, I volunteered in a Head Start classroom. God showed me his plan was for me to work with children. Being a teacher was so fulfilling, so I looked forward to being a mother. However, infertility problems plagued me. With many prayers, we had two miracles! Motherhood....the perfect vocation for me. Now writing feels like where my voice needs to be, but in what way, I’m not sure. Thank you for giving me much to consider! Please put my name in for a critique. Sherida, I'm so glad you had that chance to volunteer and find your vocation! That's a really smart thing to do. I recently told my daughter to consider volunteering or doing internships or at least doing a day on the job with someone in the areas she's considering. I'm also glad you had your two miracles! I hope you feel a strong sense of leading wherever God wants you to go next. Missy, I thought of this quote most of the day today. I also contemplated on my calling. When we say vocation, we think of our jobs. When we're in the midst of our work, at least I sometimes get so bogged down with it, I don't see HOW it can be a calling. How do our vocation actually serve or answer God's call. Sometimes I still ponder on that. I loved what I did, and the imperative word is "LOVED", in the past tense. So does that mean it no longer is my calling? Yet, as we continue on, realizing that God's given gifts has its purpose in our lives as well. Using His gifts may not necessarily fall under the umbrella of what you think it is. Planning CFRR had utilized some of the skills I've acquired in my job, but also the gifts He has given me that I didn't realize before. Though I still don't know if my vocation is my calling, but seeing how it all played out, it's encouraging to know we have a Master Organizer at work. Who is to say calls don't change? Annie, you brought up some excellent things to consider. What if we don't enjoy our jobs anymore? What if we've learned some new skills and find new work that we enjoy more? I think this varies so much with each individual. Often, work gets really difficult no matter what our job is. There are fun parts and there are parts we don't like. With writing, there are the rejections, and those are definitely a part of the career that I don't like. There are things like WRITING SYNOPSES that I definitely don't like. LOL But on a balance, I love writing. So I guess what strikes me is that whatever our vocation, there will be tough times. Is that cause to follow the call to a new vocation? Maybe. Maybe not. But it might mean it's time to pray and ask God for direction. And I guess, ultimately, we should stay tuned to God all along to see if we're still where He wants us to be. Yes! Yes! Yes! I use the word mission. God has a mission for each of us. It could change, depending on the seasons of life. So early on, my mission was to be a mom! Then, as children grew, I started to say "yes" to my desire to write and soon realized that it wasn't a me-thing but a God-thing. I write because He prompts me to write. It's what I'm called to do at this stage of my life. My mission. Yes, my vocation. Thanks for a great post, Missy! Debby, I love the term mission! And I love how you stated this: "I started to say 'yes' to my desire to write and soon realized that it wasn't a me-thing but a God-thing." I love that idea that if it's something you can do on your own, it's not a calling. That puts it in a very spiritual, eternal perspective. Beautiful, Pat! 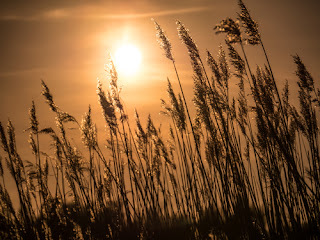 Pat, I love this quote that you said: "I've always been taught that most times, if your desire is something you can do on your own, it's likely NOT from God. If it requires His help and intervention, then it very well could be him asking you to do something." Very cool thought! It encourages us to stretch and step out in faith. I pray your business expansion is successful and that you enjoy your writing time again! Oh Pat! I am so excited for you! Missy, In Blackaby's Experiencing God Bible study, he talks about God calling us to join Him in His work. And sometimes He must prepare us to do the work first. I thought how well that fit writing for God. He may call us to join Him in writing for Him, but He may know we need to prepare first, to study craft, to wait until we're ready, just as Abraham had to wait 25 years before he was prepared to be the father of Issac. For sure! Abraham didn't handle the wait well! Inspiring post, Missy! I found it especially so because I have my entire life's road ahead of me. Lots of tough choices about vocation and occupation to make. I may have found writing at a young age, but I thank God that I did, because at least with that I have a dream, a goal to work toward and to accomplish, and just the teeniest, foggiest notion of what I want to do when I grow up. I'd love to be entered for the critique! Nicki, yes, you have plenty of time to figure it out! And sometimes it takes some trial and error to learn what we love. I'm glad you started your writing early! You'll have a lot of experience. I read this post this morning, but then the grand girl claimed my attention all day, but it's been with me all this time. I believe God gives everyone a talent, a dream, something that is their special calling. Not that people can't have more than one talent, but then there's that one thing that they excel at, they love doing, and they impact others by doing it. And... many times, that one thing is what they fear the most, as well. Yeah, Pam. I wonder why we fear it? Maybe, like me, we're afraid to fail. Or afraid we're just not up for it. We need to have faith! Yes, I believe this is true. The dream is so important to us that we fear we can't do it. Maybe this is why so many never go for their dreams... whatever they may be. Fear of failure. Tracy, I'm so glad you found us! Welcome! I'm glad you found the post helpful. We hope you'll come back! I've got you entered. We'll list all the week's giveaway winners in our weekend edition (on Saturdays). Brenna, I'm glad you dropped by! Keep learning and praying (and writing!). :) Like I told some of the other teens above, you have plenty of time to figure out what you'll be doing after high school and college. It's such an exciting time! I'm glad you found the post helpful. Missy, I have replied to this post numerous times, and I keep erasing it because I do not want to type such a long, long response. I am going to cut this short and just say I believe writing is a calling, and I believe that God has called me to it. My earliest memories are of storytelling (okay my mom might call it lying...just kidding...though I did that too). Lots of things continually seemed to have gotten in the way of that, but the biggest was fear and not feeling like I could do it that I wasn't good enough. I'm over all that now. I'm going to do my best and get those stories out and God can do with them what He will. The other call I felt God put in my heart was radio. I've been doing that for ten years now. He knew. He opened doors. Kelly, don't ever worry about posting long responses! We always want to hear how you're feeling and what you're thinking. Radio and writing are both exciting vocations. Congrats on the radio career. I'm glad you're moving past those old fears and moving ahead with the writing, too! I agree that writing can be a calling and you can tell the writers who are called to write and the ones who write for themselves. I read Christian fiction because its a clean read and I like the faith element. Their are probably writers who don't even realise its a calling that God put on their hearts. The fact they just have to write is often enough to know God is giving them their desire. (I hope that makes sense I am in a lot of pain tonight). I think its the same with other areas I am not a writer but I do cleaning for some people while it may sound like just a job I feel God has put me where I can be of help to some of the people I have worked with. (Currently unable to work due to shoulder pain after surgery which I am beginning to regret). Books have blessed me and I am thankful for authors. Jenny, I'm sure your work blesses the people you help! I pray your shoulder heals soon so you can get back to your vocation. Hang in there! Jenny, praying you get to feeling better soon! And I totally get what you're saying... everyone has a vocation no matter their job or even ... lack of a job. Thanks for the post. I daily need to be reminded of His calling. 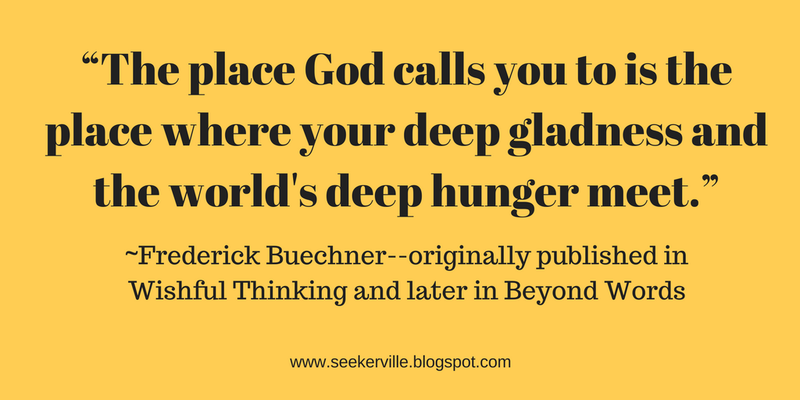 I really like the quote by Freseeick Buechner - I need to find my deep gladness in meeting the world’s deep hunger. MH, I hope you can find that! It's a great thing to think about. Has anyone else noticed that comments are slow to post for the last couple of days??? Or is it just my computer (with the recent OS update)? I've noticed it, too. I thought it might be my slow laptop and my internet. I'm glad it's not just my computer. I got the newest security updates and they said it might slow things down a little. Thank you Missy for sharing your thoughts and these wonderful quotes. I firmly believe that authors can minister through their stories. There are many who may never hear a minister's message that will hear God's voice through those words. Wish thst I had something for you to critique but I know soneone will be thrilled! Connie, you're so right! I hope to reach people who may have never set foot in a church. Oh, Missy, these words are for me today. I am going back to my writing today after a short hiatus and it seemed like just a guilty pleasure until I read your words. Pondering all the wisdom in your blog. Yes, put my name in the cat dish for the critique please. I'm a day late, Missy, but had to comment and say what a WONDERFUL post!! Thank you for sharing this with us---I love how your stories have touched readers' hearts and they took time to let you know. :) A sure sign that you're called, imho. I do think my writing is a calling in this season of my life. Up until my spinal issues became so severe, I knew without a doubt that working with young children was my calling. But when I could no longer physically teach, I saw clearly the Lord had opened the door for my writing (which I'd loved for years, but never had enough time!). Patti Jo, thank you! I hope you'll enjoy your time now for writing. I hope you're able to sit or stand and write without pain. Karen, thanks for sharing your story and your passion for the subject. I can't remember the different opinions we had in that discussion that day a couple of years ago (and couldn't remember where to go look). But I think some people felt writing was their job, but not a calling or ministry. And that's fine if it isn't for them! I'm sure they're called to something else. Also, I think some people may wonder how it can be a calling/ministry if they can't sell a book and no one reads their work. I can understand those thoughts and feelings. Enjoyed reading this. LOVE that you were/are so interested in microbiology. How fun is that?! Different phases of life, different vocations, but all in response to God's call. I'm hearing His call myself. Not a 5th book for now, but to get in front of more elementary and middle school students and present May's stories of hope... also teach some aspects of writing too. Glad Seekerville's journey goes on. Different chapter, all exciting! KC, I hope you can work out the school visits! Those can be so fun. Truly enjoyed reading your post. I wrote about this in a recent blog post (https://wp.me/p9ppOI-B). I've been writing and publishing for a while but kept feeling like something was missing. In the end, I finally ackowledged it. God was missing. No matter how much I tried to resist that fact, I kept returning to it. I was given the gift of writing for a purpose. It was time to use it for the right reasons. Carrie, thank you for sharing your link! I look forward to reading about your journey as well. Thanks for coming by! You are a fantastic writer! Eva Maria, thank you. And thanks for coming by! Missy, I love this post! There is so much I could say about it. But what I will say is, you and I think a lot alike, that writing is our calling and our ministry. I am a Christian fiction author of 3 books. The comments you quoted from readers are very similar to the ones I've received. The funny thing about me is, I had never considered writing. But then one day...and the rest is history. Let's connect. I'm sure we'd have a lot to share. Faye, it's so interesting that you never considered writing. I didn't either until I was put on bed rest with my second pregnancy in 1994. So we're similar there, too! Missy, what a true blessing it is to have this gift of writing God has called you to! I know how it is, because I thank God for it every day. Yes! My publisher asked me one time why I wanted to be published. I thought, "God has given me these words. Why, if not to share them with others?" I pray all the time that my writing will touch others in some way, show them Christ and all His glory and goodness. I know already, less than three months after my book was published, that it has been read by people who don't even know me. Those are people I never would have reached otherwise. Yes. God gave us this talent and these words for a reason! I'd love to be entered in your drawing, if it's still open. Amy, isn't it wonderful to hear from readers?! I've been blown away by some of the stories they've shared with me. Such a blessing. Catching up late! I can't let this post go without thanking you, Missy, for the encouragement. I'm a not-yet-published fiction writer with a second calling as a full-time grandnanny. Our son-in-law and daughter both work. Our daughter's work is a social justice calling, as well. So my husband and I moved (843 miles) to support them and their baby. And to have fun. Writing--a love of story and words--is a gift from God. Where God will take all this is a mystery. I'm counting on blessings, and praying to share his glory somehow. I'm a few days late to the conversation, but how I needed to hear/read your words today! You have spoken directly my heart's need at this moment. Thank you so much for the encouragement. Amy, I just now saw your message (months later). I'm so glad you were encouraged!